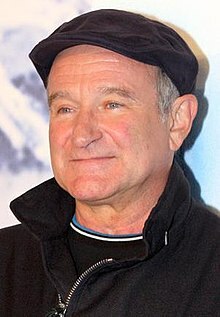 Robertinus Williams (natus Robin McLaurin Williams Sicagi die 21 Iulii 1951; mortem sibi conscivit Paradise Cay in oppido Californiae die 11 Augusti 2014) fuit comicus et histrio Americanus. Eius cursus honorum Mork & Mindy gratia coepit. Inter bisavos? fuit Anselmus Iosephus McLaurin, gubernator Mississippiae. Gilbey, Ryan. 2015. "Robin Williams obituary." The Guardian, 3 Novembris. Smith, Nigel M. 2014. "Robin Williams' widow: 'It was not depression' that killed him." The Guardian, 12 Augusti. Vicimedia Communia plura habent quae ad Robertinum Williams spectant. Novissima mutatio die 28 Februarii 2019 hora 01:34 facta.